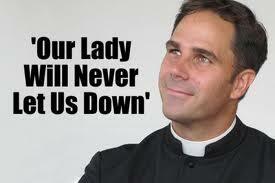 Father Donald H. Calloway, MIC is our guest for this most special Catholic Vitamins. 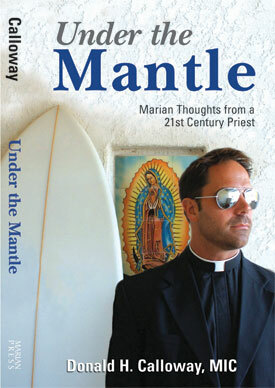 The majority of our time and questions answered have to do with Fr.’s new book: UNDER THE MANTLE: Marian Thoughts from a 21st Century Priest. WHAT A BOOK!!! Fr. Calloway has written many academic articles and is the editor of two books: The Immaculate Conception in the Life of the Church (Marian Press, 2004) and The Virgin Mary and Theology of the Body (Marian Press, 2005). He is also the author of Purest of All Lilies: The Virgin Mary in the Spirituality of St. Faustina (Marian Press, 2008) and the Catholic bestseller No Turning Back: A Witness to Mercy (Marian Press, 2010). What is this new book about? Well, the title and subtitle convey that this is about Fr. Don’s favorite saint, the Blessed Virgin Mary. From the back of the book: “One of the biggest challenges facing Catholics today is the risk of becoming jaded, lukewarm, disillusioned or unenthused about the Catholic Faith… not being madly in love with Jesus, Mary and the Church is an increasing threat in the lives of many today. For this reason, this book could not have come at a better time….” Words from Derry Connolly, Ph.D., President of the John Paul The Great Catholic University in San Diego. And while I’m not in a position to make promise promises… I almost promise that if you purchase this book, it will turn your mind from any problems you have considering Marian devotion. It will help set your heart (more) on fire for the Catholic Faith and the Sacraments. It will demonstrate what 365 saints, venerables, blesseds, popes, bishops and a host of others have had to say about our beloved Blessed Virgin Mary. A Marian Gem from Venerable Fulton J. Sheen: Let those who think that the Church pays too much attention to Mary give heed to the fact that Our Blessed Lord himself gave ten times as much of his life to her as he gave to his apostles! There are 364 others of these kinds of thoughts about Mary. You’ll love reading these and marking the pages to return to time and again.